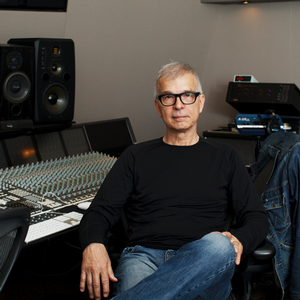 Tony Visconti, born in Brooklyn, NY, moved to London, England in 1967 and produced records there for 22 years. He is most well known for producing David Bowie, T. Rex and Marc Bolan, Thin Lizzy, The Moody Blues and Morrissey. Now based in New York City, he has recently worked with Esperanza Spalding for her 2016 album release. Visconti also engineers, mixes, is a multi-instrumentalist, music arranger and conductor. He served on the New York Board of NARAS as the president, national vice chairman, national trustee and governor. He is also a Grammy winner for Angelique Kidjo's album Djinn Djinn featuring Peter Gabriel, Josh Groban and Alicia Keys.